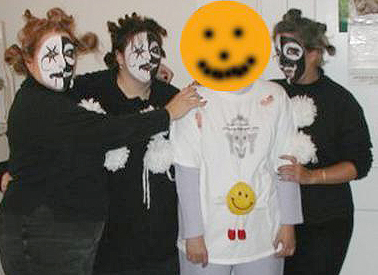 Three of us were evil clowns; one of us had a t-shirt on that said “Can’t Sleep, Clowns’ll Eat Me”. Two of us clowns sat in front of Laurie Cabot’s shop in Salem, MA and just stared at passersby…it totally creeped people out! What a riot! I’d be one of the scared people though- clowns terrify me!